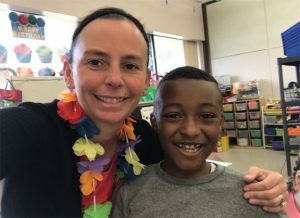 NAUGATUCK — After 16 years teaching in Naugatuck schools, Jodie Burns hasn’t lost any energy or enthusiasm for the job. “When I come in, I truly feel like it’s a blessing to be able to come to school every day and have an impact daily. … You can’t be unhappy here,” said Burns, a first grade teacher at Maple Hill Elementary School. The opportunity to affect lives on a daily basis is what Burns, a 39-year-old self-described Jersey Shore girl, said motivates her every day, and she puts her energy to good use. Aside from teaching, Burns runs the Hoops and Homework after-school program at Maple Hill, helps coordinate fundraising activities at the school, oversees the Josh Ruccio Scholarship Fund, and is a lead teacher at Maple Hill — a position that requires her to take on some principal duties when Principal Cheryl Kane is out. She also used coached the Naugatuck High School girls basketball team from 2000 to 2016, first as an assistant then head coach, before joining the Waterbury Career Academy boys basketball program as an assistant coach this past season. Everything Burns does hasn’t gone unnoticed. She was named Naugatuck’s teacher of the year for 2017. Burns, a Naugatuck resident, knew she wanted a career that would impact people’s lives, but teaching wasn’t originally in the cards. After graduating from Point Pleasant Borough High School in New Jersey, Burns attended Post University in Waterbury where she received a degree in sociology. Her initial plan was to become a social worker. She felt like she could “save the world” one child at a time. After seeing how the system worked through a couple internships, she realized social work wasn’t for her and had reached a crossroads: return to New Jersey or get her master’s in education at the University of Bridgeport. She chose the latter. Burns interned at Salem Elementary School and student taught at Cross Street School. After student teaching, she taught second grade at Cross Street and third grade at Salem before landing at Maple Hill, where she has been the last 13 years. Early on, Burns got a taste for every elementary grade before settling into first grade. The thought of being able to impact a classroom of students each year is what Burns said attracted her to teaching. Then, she realized she could have an impact on every child in the school. One of the ways she does that is through the Hoops and Homework program. Students who stay after school for the free program must do 30 minutes of homework before getting lessons in basketball fundamentals, Burns explained. Eventually, the students play basketball games. Over 150 students participated this year, Burns said. “It’s so cool to see how much the kids enjoy it,” she said. Burns doesn’t focus her energy on just the youngsters in the district. The Josh Ruccio Scholarship Fund, which is named after her late husband, has given out $34,000 in scholarships to Naugatuck High School seniors, Burns said. Burns, who has remarried and has a stepdaughter, attributed her energy and enthusiasm to her mother, Maureen Cheasty — a woman she calls daily and turns to when she needs some advice. As for her success as an educator, Burns is quick to point out she doesn’t do it alone. “I know I do a lot of stuff, and I’m really proud of what I do, but I’m more proud of what everybody does in this building. We’re such a team-type school that I never really imagined myself being better than anybody else,” Burn said. Burns thinks of herself as a leader at Maple Hill but doesn’t think she’s the best teacher in the building, or the district for that matter.